another news was about me being a leader. i can't tell you how it feels when it came to the end. when i think FINALLY THIS IS OVER! too much disappointment, too much emotion, i'm just too tired. and by the way, those aren't the reason why i post tonight. it was about a book i'm currently reading. i've been looking for this book for such a long time, and to my surprise Gramedia discounted it 70% off! can you imagine how excited i was?! it costs IDR 240000 before and IDR 70000 after the discount *bellydance* so i bought it as soon as possible at Gramedia Mall Taman Anggrek. it titled Handle With Care by Jodi Picoult. this is seriously one of touching books i adored so much. 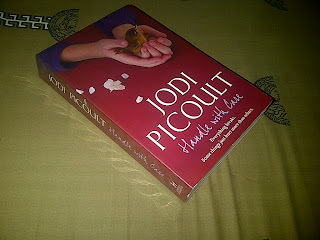 i won't hesitate to looking for another books of Jodi Picoult next time. since the last time I dropped my tears for a guy this year. 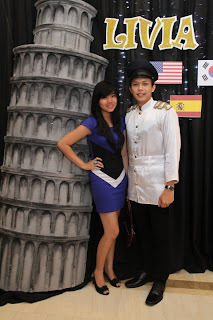 note this, 11th August :') and however, it reminds me on last year. may be exactly at these days, I dropped a large amount of tears too. and this year, I did it with the different causes for different people. I never thought I would feel this pain again, I mean this fast. but that's not why i write tonight, about became the leader, it's about the disoriented feeling i felt. it's hard for me to write, to tell, to explain exactly what i felt. it just like, i have no passion in EVERYTHING i do. in my study, in my relationship with my bf, in my friendship, in the church event, in little business i run, everything. i was like i didn't do all of those stuffs whole-heartedly. i walked next to my boyfriend, but i didn't really feel like i was there. i wrote answer on my exam paper, but i didn't feel like i think about it. i led a meeting for a church event, but i didn't feel like i was there in the front of the room. i have no idea why i felt this way. a conclusion came into my mind, simply i live my life unhappily. what should i do then? i have no idea. who i really need to fill this emptiness? what should i do to keep this lonely feeling away? and anyway i think these lyrics really suite me for now. don't you think so? I really really really grateful, for everything happened. I DO believe that everything happened for a reason, and i finally found the reason why that happened and this happened and so on. I believe every pain and every tears I've ever felt brought me to this beautiful part of my life. Gave me the strength to face everything. I just read my last post, it's about a month later. and i have to tell you, there are soooo many things happened in a month. the first thing is i had a week of holiday in Bali, seriously it was fun and i'd love to visit Bali again ANYTIME! such a beautiful and full of cultures island, and you should have a culinary trip there. I have some recommended places to go, note this! the third thing is, i finally got the result of my last 6 months' study. i got 3.56 this semester and 3.725 at all. not bad, i even think this is quite good for me. thanks God :) i really need Your guidance for the next years above in my study. Amen! last night i feel so, numbed. seriously. i just found out a little surprising fact. i can't deny that i'm not really fine for now. but i really grateful that i haven't choose you yet. i almost actually. but it's over. you quit, and i'm done, and we're done. thanks to God that i didn't give you my all. But anyway, i miss your presence. i will handle this, i really do. i just find out, that everything that supposed to be together will be together in the end. just let it be. let me flow with the wind. i'm totally curious about you hey mr.lovely. i'm dying to know what's your plan, what's your next step, WHEN's your next step. i'm just sure about you, but i'm not sure about us. there are too much differences, too far distance, i'm afraid for many things. i don't want these things going up too fast. slowly but sure. i'm sorry anw, these are just some random thoughts. i never assume anyone to read this, because i didn't public my blog's url. see ya soon!